It’s always hard to leave the comfort of a hotel to head back to the trail, and it was no different this morning. Do we have to? But we got out there eventually. Again, we took a Lyft to get back to the random spot we’d gotten picked up by our bus hitch. Lyft is great for when you’re in town, but not as ideal on trail, as we found out. We had hoped our driver would just drop us off on the side of the road, but he preferred not to pull over unless there was a designated pullout. Fair enough. Unfortunately for us, this meant that he took us about 3 miles back in the direction we’d already hiked. We kept asking if we could get out, or go back to one of the roads we already passed, and he kept telling us that we were almost there, and that it wasn’t far (as we watched the miles speed by). Finally, he pulled into one of the water stations we’d walked by around noon the previous day, several miles back from where we’d already made it. We’re both pretty sheepish when it comes to inconveniencing people, but over an hour of hiking is too much to redo, even for the sake of politeness! We asked him to take us back to the previous pull off, and an awkward 5 minutes was suffered by all. We made it back to the canal, with only one mile to redo. Time to rethink our system for getting in and out of town. As usual, the canal made for easy miles. We switched back and forth between border roads running parallel to the canal just to shake things up and to maximize firm ground. In town, the roads had been rock solid and well-maintained, but as we got further out they turned increasingly to deep sand and dirt that broke under the weight of our steps. It’s hard enough to walk through sand normally, but with an extra 40 or so pounds on your back it’s an extra level of misery. No chance of zoning out when each step takes you backward! In these moments, you focus on the tiniest detail to get you through. There were streaks of white mineral build up on the sand, most likely due to thermal activity in the area. 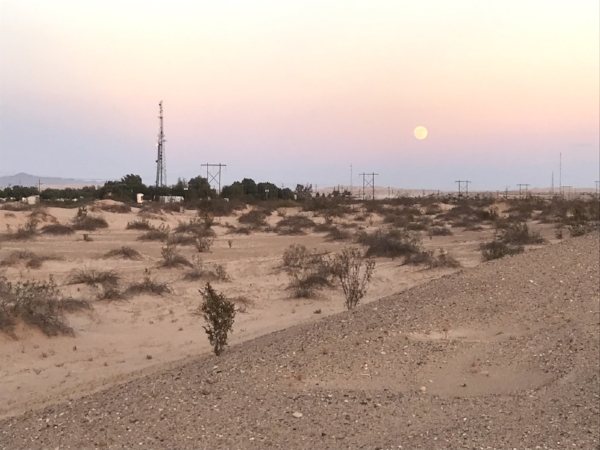 The Salton Sea, a massive body of water, lies just northwest of the Imperial Valley and powers a major geothermal energy industry, which is controlled by one corporation. The smallest tidbit of information passed to us within the last few days can take you through hours of walking. And then something else catches your eye, maybe an abandoned item like a jacket or a tuna can. These objects never strike us as trash, out here we categorize everything as someone’s. Trash is waste, while these objects served a purpose. The canal had departed from the border yesterday, but today we slowly rejoined a parallel course, with the distant smudge of the wall coming into sharper focus as the day wore on. Interstate 8 also shot towards us until we were walking in the middle of three parallel lines, the border, the canal, and the highway. Everything was washboard flat, except for the distant mountains ahead of us, contrasted against the pale line of the famous sand dunes we were about to enter. When you’re hiking in flat terrain like this, everything looks much closer than it actually is, and we kept checking and rechecking our maps convinced that the mileage was off. It wasn’t, but the easy visual of where we were headed kept us in a constant rosy optimism of being almost there. Somewhere in the monotony of the miles Tenny noticed a flash of movement and looked across the empty ditch we were hiking along to see five figures dressed in black hiding in the brush. Who is it? We abruptly stopped. With the fence separating the US from Mexico only ½ mile away, and a 500 foot dash to a major highway just to our left, it was clear what these folks were up to. They looked as young as teenagers, 3 men and 2 women, and they carried nothing, not even a bottle of water. We were still a good 200 feet away or more, far enough that we couldn’t make out any facial features, and we debated our best course of action. We decided to just sit and wait it out, not wanting to scare them or ourselves by moving any closer. We climbed the short sand wall to our left which gave us a clear view of I-8. Across the highway, we could see a parked car directly north of where the figures were moving. As they crossed the ditch and climbed the sand, the car crossed the highway, where it idled by the side of the road. The area between us and the highway was pretty open, with sparse cover of waist high bushes and we could clearly see the 5 figures dash through the sand and into the waiting car. Once all 5 were in, the car turned back onto the highway, heading into Calexico. The strangest thing about it all was how anticlimactic it all seemed. As we’ve walked, we’ve spent a great deal of time imagining what the crossing must be like for a migrant. In our heads, it’s an intense and anxious experience, followed by the relief of making it, or the terror at being caught. There are huge emotions involved, a desire for a better life, concern for yourself and those around you, fear, etc. Life-changing emotions. But the folks we saw crossing seemed...relaxed. Or maybe relaxed isn’t quite fair or accurate, but they were crossing in broad daylight and they were making no particular effort to be furtive. Getting all of them into the car took several minutes, all in view of the many cars passing by on the freeway. It just seemed so casual. One thing we did notice was that they appeared to be dry, which didn’t make sense since they would have had to swim the canal. We thought that maybe they had come through a tunnel, and the overhanging brush across from us where we’d first seen them could easily have hidden such a thing. We didn’t stop to investigate, though, once we saw the car pull back onto the highway we got back to walking. We weren’t exactly nervous, more just surprised at how quickly and nonchalantly it had all happened. It was an eye opener, and it certainly supports a theme that we’ve heard and seen evidence of consistently during our hike: that our borders are porous, and that the government isn’t really all that motivated to physically prevent people from entering. Certainly something we will be thinking a lot about as we continue our hike. After the excitement of witnessing the crossing, the rest of the day passed by quickly and uneventfully. The canal was particularly beautiful at sunset, with the light casting a pink glow and the birds flying so close to the water that their wings made a musical noise against the surface. We could see our campground long before we got there, and after ducking through the barbed wire fence (as we’d seen the runners do only hours before) and dashing across the highway, we were home for the night and ready for camp. 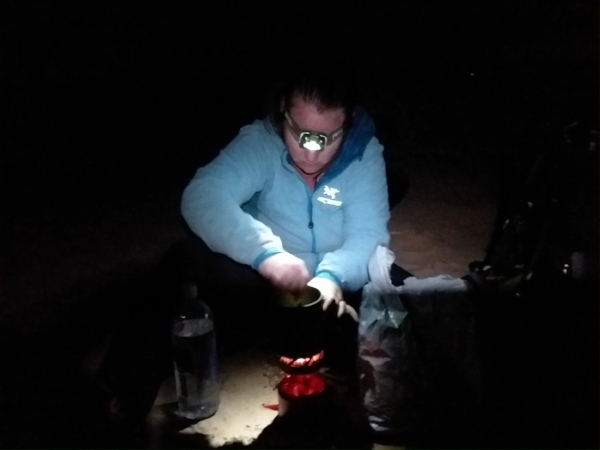 We set up in the no-mans land just outside the RV park and moved through eating and writing about the day to the sound of OTV’s blasting through the dunes. An inquisitive and ridiculously cute kit fox ran in a tighter and tighter circle around us for awhile, chasing the smell of our food, but eventually realized the futility of his efforts and scampered off into the darkness. It’s good to be back in a tent after so much town, even if the sights and sounds of civilization are still all around us.